Bluegrass songwriters Becky Buller and Mark 'Brink' Brinkman will co-host the International Bluegrass Music Association's (IBMA) July educational webinar Thursday, July 11th at 6 pm Central time. It takes two to tango, right? Well, sometimes it takes two to write a really great song. Maybe you’ve tried before and found yourself at odds with your co-writer, or maybe you and your other half think you’re the next Bernie Taupin and Elton John (of the bluegrass world, of course) and need the some expert advice on what to do next. Nashville, TN -- The International Bluegrass Music Association (IBMA) is getting ready for the newly-named Wide Open Bluegrass festival, to be held at the Raleigh, NC Convention Center and Amphitheater on September 27th and 28th. The new event to take place in the new location for World of Bluegrass promises to be exciting and the best yet. Raleigh is supporting and welcoming the IBMA to their city and they are certainly making the IBMA welcome. Nashville, TN (June 5, 2013) — Artists have been selected for the “Bluegrass Ramble” showcases, which will take place at seven different venues throughout downtown Raleigh, North Carolina during the International Bluegrass Music Association (IBMA)’s World of Bluegrass 2013 event, September 24-28. Nashville, TN -- Further information about the International Bluegrass Music Association’s (IBMA) World of Bluegrass 2013 event, which takes place September 24-28 in Raleigh, North Carolina, was revealed today at a noontime press conference at the Red Hat Amphitheater. IBMA Executive Director Nancy Cardwell, joined by Raleigh mayor Nancy McFarlane, Rebecca Quinn-Wolf of PNC Bank, Deborah Johnson, president, North Carolina Pork Council, and IBMA Board members Cindy Baucom (“Knee Deep in Bluegrass”) and William Lewis (PineCone—The Piedmont Council of Traditional Music), gave additional details about all aspects of the yearly bluegrass industry event, held for the first time in Raleigh. Nashville, Tenn. (May 1, 2013) — The International Bluegrass Music Association – IBMA – is pleased to make its first announcement of talent for the newly-named Wide Open Bluegrass festival, to be held at the Raleigh, NC Convention Center andAmphitheater on September 27th and 28th. Raleigh, NC -- Bluegrass music fans coming to Raleigh for the International Bluegrass Music Association’s annual World of Bluegrass week in September will also have a chance to chow down at the N.C. Whole Hog Barbecue State Championship in the capital city’s downtown. Nashville, TN -- The International Bluegrass Music Association (IBMA) has announced that longtime IBMA staff member Jill Crabtree will be departing the association after a long time of great service. Her departure will be no later than July 1, 2013. This means the association has an immediate position available for the right candidate. Nashville, TN -- The International Bluegrass Music Association (IBMA) is proud to announce the graduating class of Leadership Bluegrass 2013. Leadership Bluegrass is an intensive, three-day program focused on interactive learning and networking experiences that invite participants to examine the challenges and opportunities facing the bluegrass music industry, along with leadership development issues. This was the 14th year of Leadership Bluegrass, which now boasts over 300 alumni. Nashville, TN -- Have you written a new song that the bluegrass industry needs to hear? IBMA will host a Songwriter Showcase to feature the work of 10 selected songwriters during the World of Bluegrass Business Conference to be hosted in Raleigh, NC Sept. 24028. The exact date and time of the Songwriter Showcase will be announced in the future on the IBMA website. Nashville, TN -- Registration for IBMA’s World of Bluegrass 2013 events – as well as hotel reservations – opens March 1, 2013. The five-day event, which takes place September 24-28, is bluegrass music’s annual industry gathering and family reunion, held for the first time in Raleigh, North Carolina. IBMA – the International Bluegrass Music Association – is the professional trade organization for the global bluegrass music community. Registration for International Bluegrass Music Association's (IBMA) World of Bluegrass Events and hotel reservations will open March 1, 2013, for bluegrass music’s annual industry gathering and family reunion in Raleigh, North Carolina. The five-day event will feature the best in bluegrass music networking, showcasing and professional development, with lower prices across the board for all tickets and hotel rates. 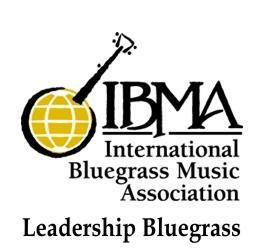 Nashville, TN -- The International Bluegrass Music Association (IBMA) is pleased to announce the participants of Leadership Bluegrass 2013. Leadership Bluegrass, now in its 14th year with more than 300 alumni, is an intensive, three-day program of interactive learning and networking experiences that invites participants to examine the challenges and opportunities facing our music, along with related leadership issues. Nashville, TN -- /IBMA/ Registration for IBMA’s World of Bluegrass Events and hotel reservations will open March 1, 2013, for bluegrass music’s annual industry gathering and family reunion in Raleigh, North Carolina. The five-day event will feature the best in bluegrass networking, showcasing and professional development, with lower prices across the board for all tickets and hotel rates. The IBMA has also announced the schedule for this year's big event. 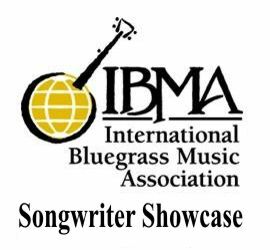 Nashville, TN -- /IBMA/ Up to 50 showcase artists will be invited for the International Bluegrass Music Associations's (IBMA) World of Bluegrass 2013, depending on the number of applicants and the qualifications of groups that apply. Each official showcase act will perform twice, and possibly three times during World of Bluegrass Week in some combination of following areas: the Raleigh Convention Center, evening showcase rooms at the Marriott or Sheraton hotels, evening showcases at six in-town venues, or as a part of the weekend street fair. There will also be opportunities for merchandise sales and, potentially, a share in showcase-generated revenues after off-site venue expenses are covered.